A low-pressure expanding foam sealant specially formulated to cure in temperatures as low as -7ºC (20ºF) and as high as 49ºC (120ºF). An ICC code complying fireblock penetration sealant suitable for Type V residential constructions. A bright white, low-pressure window and door sealant that exerts up to 90% less pressure than the leading competition so it will not warp window frames or door jambs. 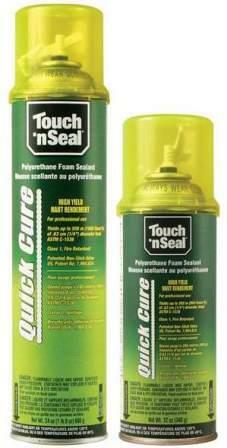 A fast and easy, high-yield means to permanently seal and insulate gaps and cracks. 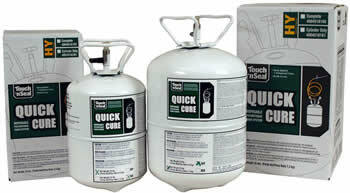 Quick Cure foam blocks drafts, moisture and insects while improving comfort and reducing energy usage in commercial, industrial, agricultural and residential applications. Available in two sizes as well as high capacity cylinders. An all-weather, one-component, ready-to-use foam that quickly condenses into a high-strength gel adhesive for use on drywall, plywood, OSB, pressure-treated lumber, joists, concrete, steel, plastic and painted surfaces. Sharpshooter applicator guns are specially suited for use with Touch 'n Seal® gun foam products and come in both disposable and reusable models as well as premium long barrel foam applicators. Designed to work with Touch ‘n Seal’s complete line of products, Poly-Clean easily removes wet polyurethane foam from hands, tools, or applicator gun baskets. It can be sprayed onto a cloth for general cleaning or attached to a gun basket and sprayed to thoroughly clean applicator guns.